Ballot – The latest Nanos federal ballot tracking has the Liberals at 39.6 per cent support, followed by the Conservatives at 31.5 per cent, the NDP at 14.5 percent, the BQ at 2.4 per cent, the Greens at 6.9 per cent and the newly formed People’s Party of Canada (PPC) at 1.1 per cent. Accessible Voters – Asked whether they would consider voting for each of the federal parties, 49.8 per cent of Canadians say they would consider voting Liberal while 46.1 per cent would consider voting Conservative. Roughly one in three (34.3%) would consider voting NDP, 31.4 per cent would consider voting Green, 11.6 per cent would consider voting for the People’s Party and 23.7 per cent would consider voting for the BQ. Preferred Prime Minister – Nanos tracking has Trudeau as the preferred choice as PM at 38.2 per cent of Canadians followed by Scheer (21.9%), Singh (5.8%), May (5.7%) and Bernier (2.3%). Twenty five per cent of Canadians were unsure whom they preferred. 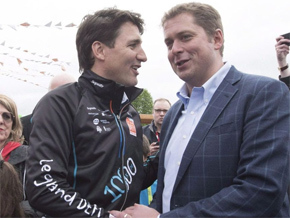 Qualities of a Good Political Leader – More than half of Canadians (55.7%) believe Trudeau has the qualities of a good political leader while 40.0 per cent believe Scheer has the qualities of a good political leader. Close to three in ten (28.0%) say Jagmeet Singh has the qualities of a good political leader, while 31.3 per cent believe the same about May. One in six (14.5%) believe Bernier has the qualities of a good political leader and one in five (20.4) said Beaulieu has the qualities of a good political leader (QC only). Nanos Party Power Index – The Nanos Index which is a composite of a series of measures including ballot and leadership impressions has the Liberals with 56.4 points, the Conservatives 52.2 points, the NDP 40.8 points, the Greens 35.1 points, the People’s Party 27.0 points and the BQ 31.2 points (QC only).